Llwyd joined the SCA in 1990, while in grad school. He was one of the first fencers in the Barony of Black Diamond in Atlantia, authorizing in February 1992. His post-doctoral work took him to the Marche of the Winged Hills, Barony of the Flaming Gryphon, Kingdom of the Middle (Dayton, Ohio). He was Baronial marshal of fence and a deputy seneschal for the Marche, the Barony, and the Northern Oaken Region. He also served as deputy chronicler, publishing The Gryphon’s Tale, the Baronial newsletter. Llwyd has been inducted into the Order of the Cavendish Knot, for service to fencing in the Midrealm, and was chosen for the Midrealm’s Fencing Champions team to compete at Pennsics 24 and 26. He’s also the principle (i.e. first) member of L’Acadamie du Griff, Flaming Gryphon’s fencing order. He joined the Acadamia, a fencing household based mostly in the Midrealm, with the rank of Dean. Llwyd also was one of seven initial schlager authorized fencer/marshals who helped to bootstrap the move from epee to the heavier blades. 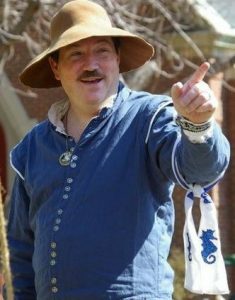 Llwyd also makes his own historic costuming, and was active in the Flaming Gryphon Elizabethian acting guild: The Lord Chatelane’s Men . The guild has been honored with the Order of the Grove for excellence in the arts for a group. It was also selected by the Midrealm to serve as one of the entrants in the Pennsic 24 Arts & Sciences Championships. A job change took Llwyd to West Kingdom, where he was active in the push to get period rapier combat accepted, His draft proposal for West Kingdom rapier rules was one of several components of the unified proposal to the Crowns, which after lots of rearranging became the West Kingdom Rapier Combat Rules and Marshalate Manual. Llwyd served as Principality Rapier Marshal for the Principality of the Mists, Kingdom of the West. In 1999, Llwyd returned to Atlantia where he has lived happily ever since. In 2003 he became Baron of Tir-y-Don. In 2007 he retired due to Kingdom term limits and became a Baron of the Court of Atlantia. He was honored with being made a Companion of the Order of the Sea Stag for his marshal teaching in 2007. In May 2007, Llwyd became the 35th Provost in the Atlantian Academie d’Espee (The Order of the White Scarf of Atlantia). Llwyd served as the Atlantian Kingdom Rapier Marshal from February 2009 to February 2011. In November 2009, Llwyd was given a writ to join the Order of the Pelican. He sat his vigil and was elevated in February 2010. He served on the Atlantian champions team at Pennsic 41. With the introduction of spears to the rapier weapons list, Llwyd built a rapier weapons force testing rig based on one created earlier by Don Tivar. He collected thousands of points of data from dozens of fencers across many Kingdoms. In November 2014 he was recognized for both the science involved in that research and for his contributions to the arts with his study and teaching of Fiore with Atlantia’s Order of the Pearl. 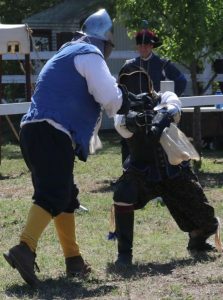 He was elevated to the Order of Defense in August, 2018, on the field at Pennsic.